We’ve added a new page which will follow the site’s opening and the days beyond. Also, as you may or may not be aware, tickets are required for the climb up the Vessel. We’ll be at the location on Friday, March 15, 2019 and will also have the chance to climb the Vessel next week a couple of times. Will be reporting back at the new page with photos and more. According to numerous sources, Architectural Digest & 6sqft, Hudson Yards’ opening date will officially take place on March 15, 2019. After learning of this news we reached out to the folks at Hudson Yards and hope we’ll be hearing from them soon in as far as verification is concerned; yet, a look through their archived press releases reveals one indicating Snarkitecture’s Snark Park opening at 20 Hudson Yards for that very same day. Snark Park itself will be a permanent exhibition space which is to feature a Rotating Series of Immersive Installations. Yours truly is excited about this revelation since, being a photographer and all, it’s sure to be quite the spot to truly bring out the hopeful best in this shutterbug. I imagine I won’t be the only one interested in the photographic opportunities to be had there. Rest assured, this page or other related postings will bring us up to date regarding the grand opening itself of Hudson Yards. For those of you unfamiliar, Hudson Yards is the brand new mega-real estate development, built from the ground up, encompassing the area of the low 30s on the west side of Manhattan from 10th to 12th avenues. 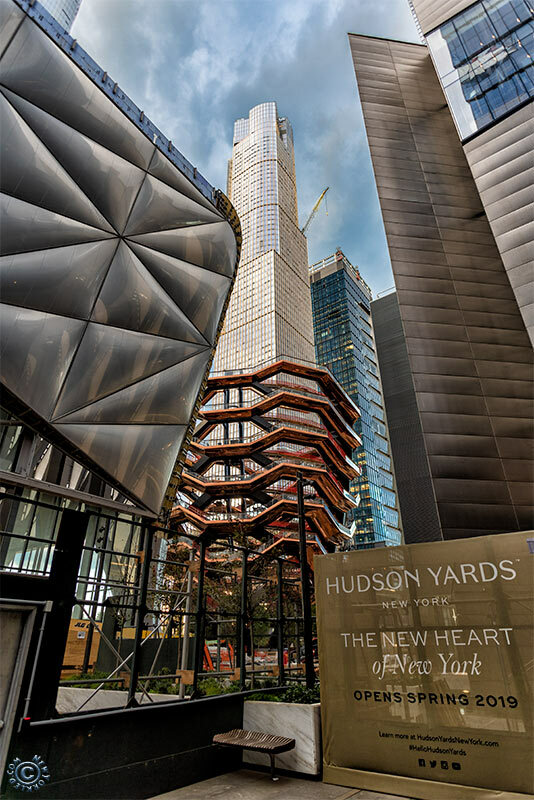 As per an official statement: “Hudson Yards is the largest private real estate development in the history of the United States and the largest development in New York City since Rockefeller Center.” It will be comprised of 18 million feet of commercial and residential space featuring over 100 shops, a collection of restaurants, a number of architectural and fine arts attractions and venues amongst other offerings.